JayTheBanker's Blog: Hello Chicken Dinner!! It's that Chicken Dinner time of year again!! Many people around El Reno and Canadian County eagerly await this event each and every single year.. Some folks even refer to it as their OFFICIAL "Family Reunion"! 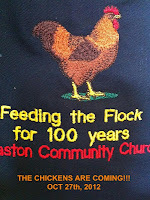 THE ANNUAL HEASTON CHURCH CHICKEN DINNER is slated to happen SATURDAY, OCT 27th from 5:30-7:00 PM .. and all you have to do is show up and partake of some of the best food in the County! The dinner is FREE to all who come. Donations are accepted and go to local church ministries. Come out and meet our new Pastor, Justin Racca...You can see him, me and the CEO of all things chicken, Byron Wood, in the video below. Great food, fellowship and getting to see folks you haven't seen in years - or maybe just since last year's dinner. Homemade fried chicken, mashed potatoes, salad/dressing, gizzard and livers and all the homemade pies - JUST INCREDIBLE! We have been blessed over the years by meeting so many great people and this year we hope you're there too! And if you're interested...come out on Saturday mid morning and watch the official Heaston Potato Peeler Crew!! For more information about where Heaston Church is located (~9mi SW of El Reno on Country Club Rd) or if you have any questions you can contact the church office at 405-262-9035 or go to our website. Of course, you can always email JayTheBanker!